What About Religious / Moral Conviction? Vaccines created with and containing aborted fetal cells will be forced into the blood stream of my child expressly against my moral and religious conviction. What about parents who find injecting their children with vaccines created via aborted fetuses MORALLY UNACCEPTABLE?? 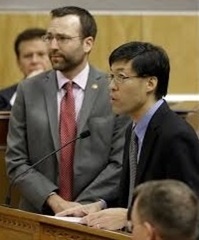 Senate Bill SB277, introduced by Senators Pan and Allen on February 19, 2015. This bill has become LAW. It will apply to ALL students in California, whether they are enrolled in public school, private school, parochial/religious school, charter school. California's current vaccine schedule in which children receive 69 doses of vaccines for 16 different viral and bacterial illnesses which includes vaccines that are for sexually transmitted diseases (i.e. Hepatitis B at birth, and HPV, possibly soon to be required for kindergarten). This amount more than doubles the government childhood schedule of 34 doses of 11 different vaccines in the year 2000. According to number 11 in the law, additional vaccines will be added at any time by the State of CA, via the California Dept. of Public Health, without limit or public input. Those supporting forced vaccination are being dishonest by not acknowledging the exploding vaccine schedule while sounding alarms over small increases in overall non-medical exemptions. 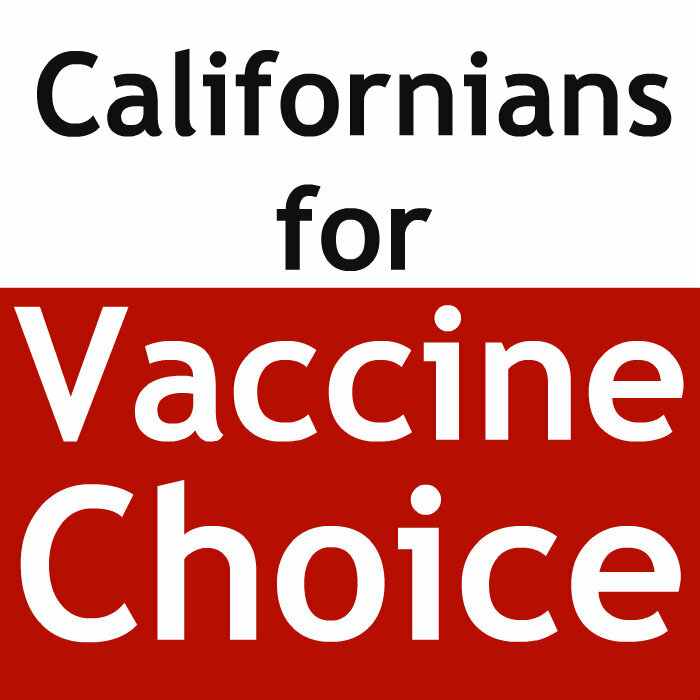 Every resident in the State of CA from preschool to the age of 18 will be forced to be vaccinated with every mandated vaccine in order to reside here and to be eligible for any public or private school. Since education is compulsory, opting for no schooling will not be an option. When vaccine mandates are law, the only way a parent can protect their children from the known and unknown dangers of vaccines and/or from the known and unknown problems with the current vaccine schedule is through the use of exemptions. If SB 277 passes, there will soon be no more exemptions for such protections. This law would eliminate the right of parents to opt out of any vaccines for their children for personal or religious reasons. Families with conviction about the development of vaccines using aborted fetal cells will be forced to violate their religious beliefs. As a result, unless a child has a medical reason for not receiving a particular vaccine (which essentially means that the child can prove damage by a vaccine), children will be forcibly injected with every vaccine the government deems appropriate. The Law passed and is a devastating blow to patient rights, parental rights and the very concept of liberty that this nation was founded upon. It’s understandable, the desire to protect children against dangerous diseases, but forcing every child to take every dose of a government mandated vaccine is not the answer. 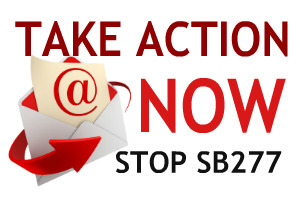 (Largo Fl) Children of God for Life is calling on Senator Richard Pan to retract the outrageous claims made during his testimony at hearings for SB277 that would end both personal and religious beliefs exemptions to vaccination. When questioned by fellow Senator Joel Anderson on the use of aborted fetal cell lines in vaccines, Pan responded that it was “a myth”. He continued his fabrication by acknowledging the use of aborted fetal cells “in one or two vaccines” but said it wasn’t done that way any longer. Has anyone told you they didn’t believe we could possibly have vaccines produced right here in America from aborted fetal cell lines? Did anyone tell you it was a hoax? The fact that the Chickenpox, Hepatitis-A and MMR vaccines were developed using aborted fetal cell lines, MRC-5 and WI-38 has never been hidden from the public. The problem is that when parents go to their family doctors for vaccinations, who asks to see the product insert? Most parents want to know the risks and possible side effects. Like their doctors, parents are mostly concerned with the health of their children. And doctors, who have been administering the vaccines for years have never checked into the ingredients, although it has always been right at their fingertips. And what would happen if they did? They would read that the vaccine contains “residual DNA and proteins” and “components” of “MRC-5″, “WI-38″ (or both) “human diploid cell lines”. Click here for the Manufacturer’s package insert portion describing the fetal cell lines. The MRC-5 cell line was developed in September 1966 from lung tissue taken from a 14 week fetus aborted for psychiatric reasons from a 27 year old physically healthy woman. MRC-5 is a known source of human DNA in vaccines. The WI-38 human diploid cell line (RA 273) was a 16-week-old female baby (20 cm long) who was aborted in Sweden because the parents felt they had too many children. The baby was packed on ice and sent to the United States (speculation suggests without consent – which was common) where it was dissected. The use of WI-38 cells is a lucrative moneymaking business. The rubella vaccine currently used in the U.S. and in most countries was developed after an American researcher at the Wistar Institute cultured rubella virus from a fetus aborted because the mother was infected with rubella. 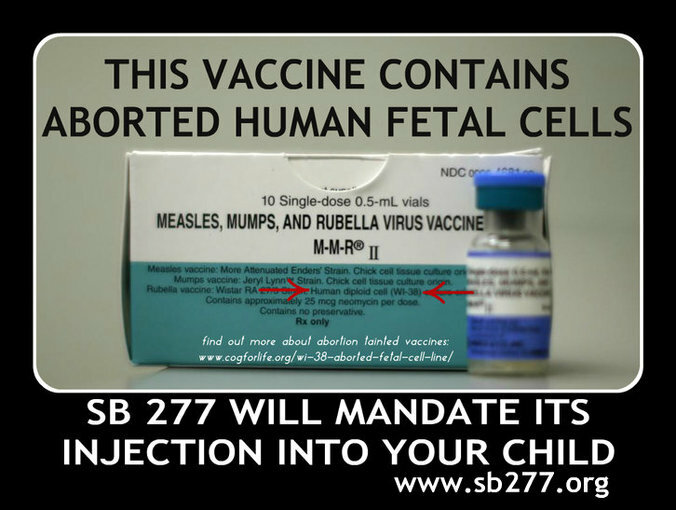 This vaccine is called RA 27/3 because the rubella virus was isolated from the 27th aborted fetus sent to the Wistar Institute in the 1964 rubella outbreak. Eighty elective abortions (recorded) were involved in the research and final production of the current rubella vaccine: 21 from the original WI-1 through WI-26 fetal cell lines that failed, plus WI-38 itself, plus 67 from the attempts to isolate the rubella virus." The HEK293 cell line is derived from the kidneys of a healthy aborted fetus and is being used to develop new influenza vaccines. IMR-90 cell line came from a 16-week old female aborted baby and IMR-91 came from a male aborted baby. Both were created for vaccine production and functional references. WI-1 through WI-25 cell strains were derived from the lung, skin, muscle, kidney, heart, thyroid, thymus, and liver of 21 separate elective (and some speculate illegal) abortions. WI-44 was derived from the lung of a three-month old surgically aborted fetus. Many of us are praying that our religious leaders will speak out against SB 277's violations of parental rights, religious freedom, prior, voluntary, and informed consent laws with regards to medicine, and perhaps other things that might be religion-specific (e.g. the injecting of aborted fetal tissue materials; the injecting of porcine (pig) viruses and materials; the injecting of known neurotoxins into an infant during the most critical times of neurological and immune-system development; performing a risk-laden, potentially-fatal, procedure on a healthy child; etc.). The fact that the Chickenpox, Hepatitis-A and MMR vaccines were developed using aborted fetal cell lines, MRC-5 and WI-38 has never been hidden from the public. The problem is that when parents go to their family doctors for vaccinations, who asks to see the product insert? 3. The movie Bought, available to watch for free through March 6th: https://www.boughtmovie.net/free-viewing/thank-you.php?AFFID=NONE&optin=1&email=kalarto%40comcast.net. "Disney, Measles, and the Fantasyland of Vaccine Perfection"
"The Oxymoron of Safe Vaccines"
And there is a plethora of information on many more abortions that were part of polio vaccine research. Read the document excerpts from the scientists themselves.